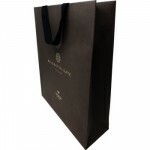 Luxury Retail Paper Bags are an increasingly popular promotional carrier bag which are perfect for your products or for your next corporate event. Magellan's range of customisable printed carrier bags have special features including: spot UV, embossing, hot foil blocking and printable insides. 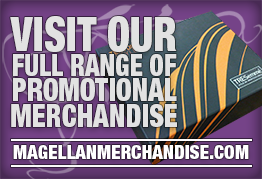 We also offer a range of paper weights, allowing your printed paper bag to reflect the quality of your brand. 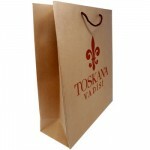 Luxury Rope Handle Paper Bag for Toskana Print: Full Colour Print Finish: Uncoated Paper Bags H.. Luxury Paper Card Carrier Bag for Entourage has a double print, the interior has been printed on and.. Printed Luxury Ribbon Handled Bag for BelgraviaPrint: Hot FoilingFinish: Uncoated Paper BagsHan..
Bespoke Uncoated Rope Handled bag for Varul Print: Full Colour PrintFinish: Matt Laminate Paper.. 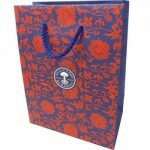 Luxury High End Bag for Neal's Yard Remedies has a rope handle and matt laminate finish. 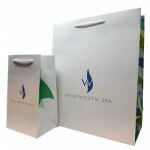 Print: F..
Wentworth Spa Luxury Paper Bag came in two different sizes and are made from uncoated paper.These hi.. 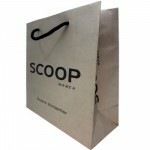 Printed Rope Handled Bag for ScoopPrint: Full Colour PrintFinish: Uncoated Paper Bag Handl..